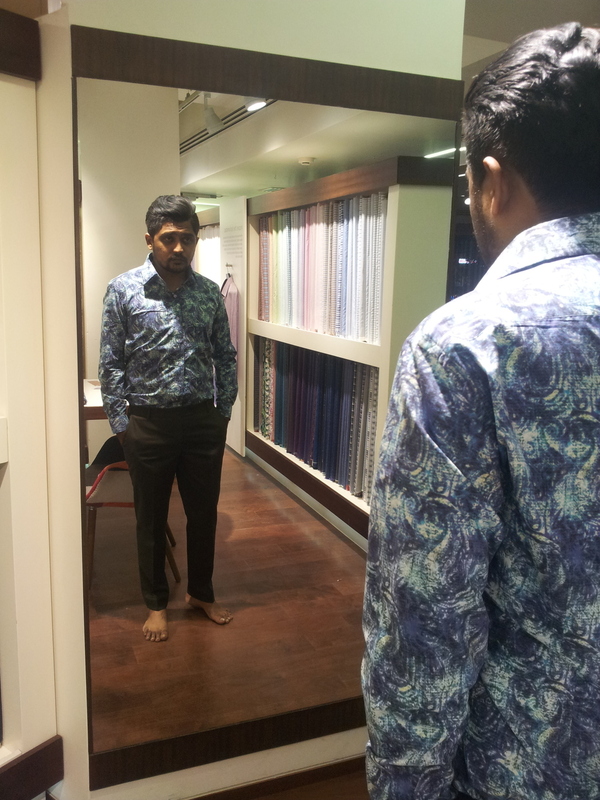 Bespoke Tailoring Part 2: Arvind 'TOUCH' - Blogger’s Meet at Bangalore, INDIA — Image Consultant & Fashion Stylist for Men in India-I am Mr. 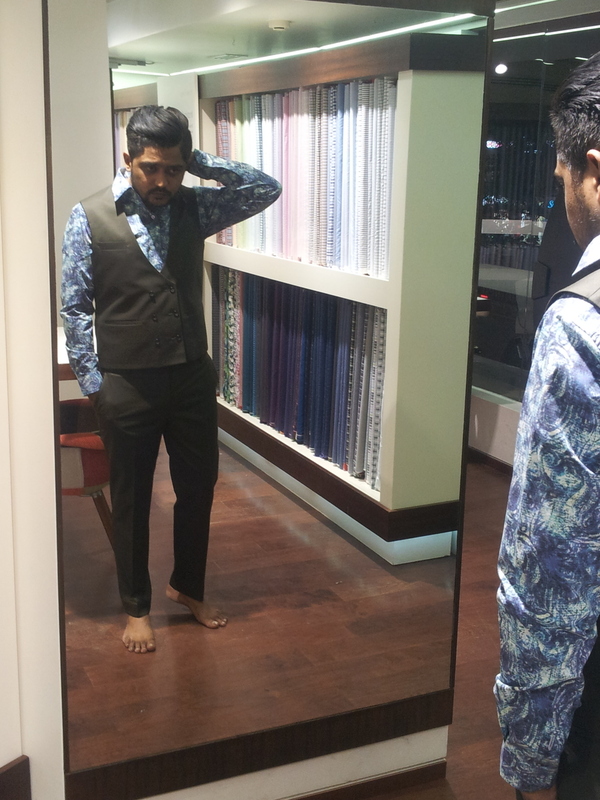 So here’s the Part II of the Bespoke Tailoring, experienced with the all new technology called Arvind 'TOUCH'. For those of you who are still wondering what this TOUCH is all about, please read the Part I of this Bespoke post, here. So continuing from where I left, after Mr. Sanoria had confirmed and entered all the suiting-shirting measurement in the TOUCH app, he advised that it would take around 15 days to schedule the first trial, in the city where I am comfortable getting the trial done. As I am based in Ahmedabad, I chose the city, which again is the home of Arvind Limited. The Arvind Store - Bangalore. 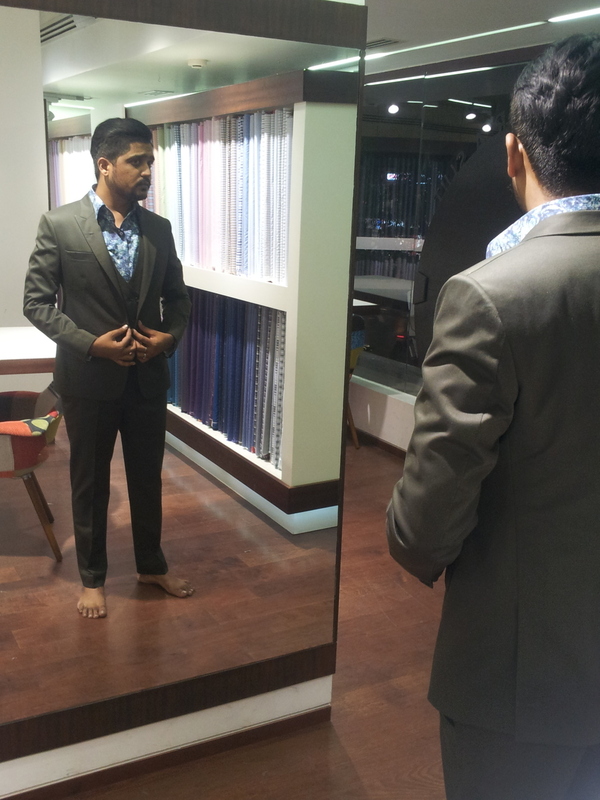 Around the 15th-16th day, I got a call from The Arvind Store, Ahmedabad that my suit is ready for trial and I should let the store know the time convenient to me so that they can arrange for their in-store stylist and made-to-measure specialist to be present. The excitement made me schedule it for the same day, in the evening. Collar styles to choose from. Variety of Buttons for Suits. A quick info about suits and its styles. The men at my service were Mr. Akhil Tamta (Stylist) and Mr. Nadim Mohammad (made-to-measure specialist) eagerly waiting to make me try their creation. I had selected a 3-piece cotton suit and hence to my horror, when I tried the piece it was all loose and clumsy. Honestly, I was sad. And before I can even say a word, Mr. Nadim started putting up pins everywhere as if I was there for acupuncture and in a few minutes he was like “What do you think now?” and I was like “Yeah looks good now.” He had put some marking around on the jacket and trousers as advised by Mr. Tamta and said that the 2nd trial would be after a week. Arvind's in-store app - TOUCH. But before leaving the studio I had lot of suggestions for them to incorporate in their final modelling to which Mr. Tamta immediately responded “ Can we come to your place and have a look at your wardrobe and other suits you wear?” At this point these guys had won my heart. MY PLACE? MY WARDROBE? MY STYLE? So that you can just stitch better?WOW!!! Next day the team dropped down at my place and made me try all my suits and trousers. I am sure they had got a quick idea about what kind of fit I prefer. We had a small discussion over that and they confirmed to meet me after a week. A week later, I was there once again but with double the excitement. Mr. Nadim was excited too and made me try that as quickly as he could and BANG – it was just too perfect. It did not have buttons yet nor the final stitches but I would have walked out of store just like that. It was PERFECT - Truly bespoke and personal in terms of the fit and the style. With my happiness I was more amazed to see the smile and sense of satisfaction on the face of Mr. Nadim and Mr. Tamta for delivering me the master-piece just the way I desired. The suit was then sent for the final finishing and I was told that in a week’s time a person from the store will deliver the suit at your residence at a time convenient to me. Like WOW, cherry on the cake. Fashion Design graduate from NIFT New Delhi 1996-99 batch. Total 16 years of experience in Men's wear, primarily bespoke tailoring. Taught design and technical subjects for 5 years at NIFT at Delhi and Mumbai. Heading tailoring for TAS now. Previously was heading tailoring for Raymond Limited.
" Custom tailoring is the art of crafting a garment as per an individual's measurements, body structure and most importantly his taste. It requires an eye for detail and a very good understanding of the body structure and postures. In all, it is a concept that provides the customer a garment that is made just for him. " Have a total work experience of 20years in retail industry, work for luxury brands like Versace, VJC, Cornelliani, Cadini, ADV, DAMAT&TWEEN, working in Arvind since last 02 years as a Technical Training Manager for Studio Arvind. Taking care of Training of all fashion stylist across India, Studio Arvind, Arvind Touch, and all Flagship store's across Pan India. With a total experience of 7 years, he is with Arvind Ltd since last 2 years. Prior to Arvind , he was associated with Nine Style - one of the top leading designer stores in Delhi . He started his career with Designer Rajad Suri in Delhi. At times there are seasonal pressures & hectic schedule, but he says that " a compliment from satisfied customer keeps him going." 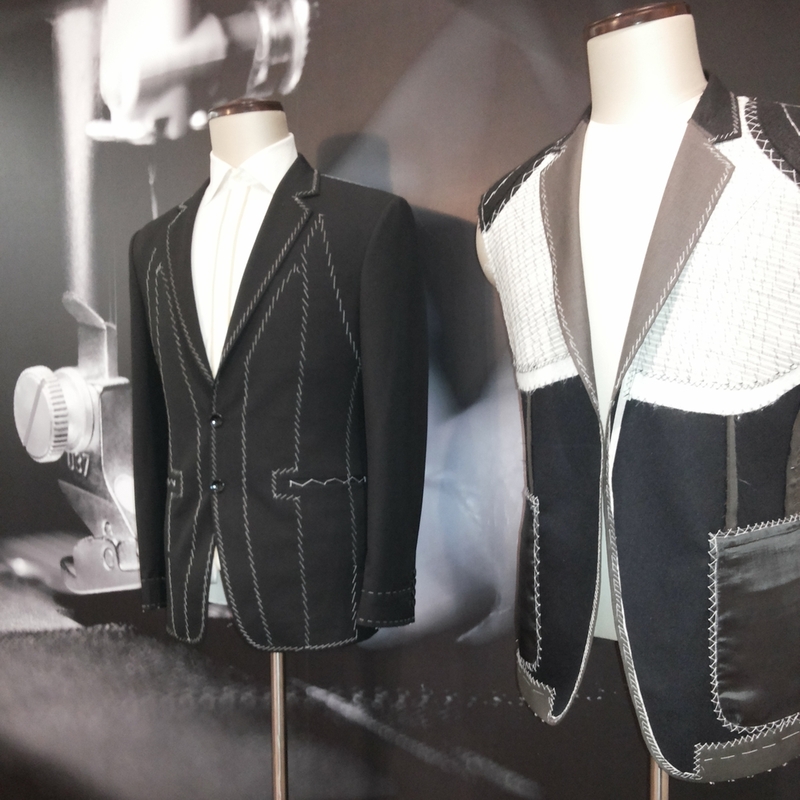 "Honestly, it was a genuine experience of bespoke tailoring along with the use of technology. A bit time consuming but a garment that shouts PERCFECTION. I totally loved it and would want you guys to at least visit the store for the TOUCH app and to meet their in-store stylist, they are FANTABULOUS. Will surely show you some more photos about my bespoke suit and how to style in my next post. Untill then, stay sharp, stay stylish."